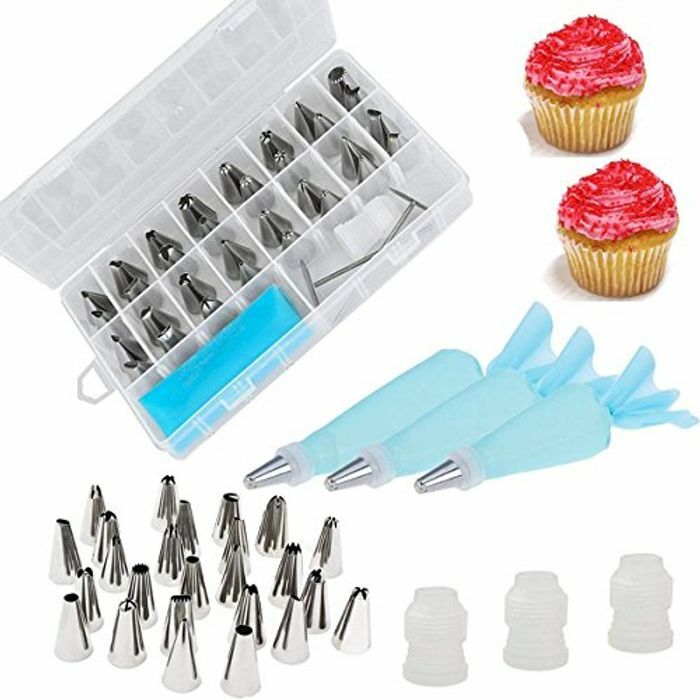 【Cake Decorating Supplies Kits】This Cake Decorating Supplies Kits includes the most necessary items that a baker needs for perfect cake decoration:32 stainless steel icing tips, 3 reusable silicone pastry bag, 3 reusable plastic couplers, 3 flower nails, with which you can create all types of patterns on cake, cupcakes. 【Cake Decorating Tips】This set includes open star tips, closed star tips, french tips, round tips, plain tips,leaf tips, petal tips, special tips. 0.7 inch in diameter, 1.26 inch tall. All this stored in the cute plastic case. 【Function of Pastry Bags, Couplers, Flower Nails 】 Three reusable silicone pastry bags are support different color icing while decorating cakes or cupcakes.Three Reusable plastic couplers are easy to switch quickly from one tip to another tip; Three flower nails used as a decorative bottom bracket to decorate icing flower. 【Safe and Easy to Use】 Strong, durable, stainless steel, corrosion resistant, reusable, non-stick, tasteless and non-toxic,easy to clean and dishwasher safe. 【Application】 Seacue decorating set is a perfect tool to create scrollwork, lettering, flowers, borders, and other frosted accents on cakes, cupcakes, cookies and more, for your next birthday or wedding.